September 17, 2012, filed under Statements from Peace Strike, vigil for Iran; 4 Comments. On Wednesday 12th of September, from Parliament Square, Peace Strike launched the “VIGIL FOR IRAN” This is an on-going pre-emptive campaign to prevent a war with Iran. We welcome campaigners, concerned citizens and anyone who cares for peace and justice, to join us for the initial two hours from 5-7pm to establish a weekly peace presence that will build up and spread to other strategic locations around Westminster and Whitehall. The aim of the campaign is to unite supporters, and bring together different diverse groups and individuals so that our presence will be peaceful, powerful and effective. We wish our presence to be felt by the political powers, in order that they will have no option but to listen to us and take on board our concerns. As well as acknowledging our concerns, we want them to act on them and change any plans they have for war. A PRE-EMPTIVE ATTACK ON IRAN WOULD BE ILLEGAL. So far, to date, there is no evidence that Iran has nuclear weapons capability. Even if they were to have the ambition, this in itself would not be illegal. What would be illegal would be a pre-empt war of aggression that in no way could be legally justified. It would seem at times, that many people in our communities are beyond caring obout anyone but themselves. We live in selfish times, we are all aware of that. We suffer the consequences every day in our own lives. If we don’t care about each other, why then should we care about others, especially if we don’t know them. YES, OF COURSE IT MATTERS! If a pre-emptive attack was launched on an Iranian nuclear site, then the very minimum amount of people to be killed initially would be in the region of 100,000. Iran would retaliate. After this, no one would know when it would end. This action would effect the whole of the Middle East and have major repercussions globally. The media propaganda would have us hating anyone who looked Iranian, even though they were attacked and would have been forced to defend themselves. There would be retaliation in this country and we would see communities turn against each other. At some point we would have to rely on the authorities to save us from each other. The irony would be that we would then be grateful to a government for saving us and our communities, even though they ignored our wishes not to go to war! The governments fear an uprising so would manipulate the situation so that we would turn on each other! Endless war would mean that young people would eventually be called up to do their duty for our country. Patriotism would be called for and those not willing would be seen as disloyal and untrustworthy. IRAQ /AFGHANISTAN PEACE MOVEMENT 2002….2012…..
We have been down this road before, Afghanistan, Iraq, Lebanon, Gaza, Libya, Syria…..
Pakistan is being being continually bombed and is not mentioned as a country at war, we just go ahead unchallenged. To date, we have not stopped any wars. The will of the people has never been strong enough to succeed. Our weakness is that we are easily divided. The “Vigil for Iran” plan is to start small and get bigger each week. It is grass roots lead and is non-partisan. We are not affiliating ourselves with any Iranian political parties. As concerned citizens our duty is to the families and civilian population that would be victims if such action were undertaken. We are not prepared to accept war as the answer to making peace and establishing freedom and democracy! We refuse to be complicate in any more war. We demand an end to war and our troops brought home. The “Vigil for Iran” promotes peaceful action and is peaceful in its intent. Please join us every Wednesday between 5-7pm either at Parliament square in London or in a solidarity action of your own organizing. nor will we be divided by propaganda. November 15, 2011, filed under PRASRA 2011, Statements from Peace Strike, vigil for Iran; No Comments. It’s up to us, the grass-roots movement! We all know our Government is NOT listening to us and is allowing the situation in the Middle East to build up to further confrontation. We must organise and act now, if we really want a chance to stop a war with Iran. We cannot afford to think this might not happen! We cannot repeat the mistakes of the past and leave it until an attack on Iran is imminent or a pre-emptive strike has been made. Even if an attack were to be officially declared, by then, marches, rallies, sit-ins and protests would not be effective and would be too little, to late. REALITY CHECK – Let’s all unite and go on strike together for all the reasons mentioned, with the aim of actually achieving our objective. We have NOT STOPPED ANY WAR……….THEREFORE….WE NEED TO TAKE EVASIVE ACTION NOW! Our priority must be to bring our own troops home in order to prevent further war. The military industrial complex has the same wants and needs of mass global companies. Collectively, the military consume the most oil, therefore, they MUST secure more oil supplies, whatever the cost. Global companies buy, take over and dominate by financial power. If they can’t buy or control a country, they will demonise the country and then BOMB it into submission. They are the two arms of the same beast. The military is being used as the ‘armed wing’ of the Global Corporate Empire. By demanding to ‘Bring Our Troops Home’ and prevent further war, we will directly compromise and effect the political, commercial and military power all at the same time. The governments of the world will always ignore the people’s natural opposition to war simply because they can. The only real power the people have is to refuse to comply. While we keep working, they launch ships, submarines, fighter jets, missiles, rockets, drones, deploy soldiers,…..and ignore our wishes…. We are the ones who fund the war effort, fund the repatriations, fund the funerals, fund the rehabilitation, fund the post traumatic distress disorders, and then also pay voluntary contributions to the many charities that support our war wounded. All this, and then, if we disagree with the justification and morality of the war, we live in fear of being labelled ‘unpatriotic’ It is a clever control method that always works! We must act now, while we still can, in order to prevent a future world based on military order and compliance. By collectively being on “Peace Strike” together, we – the ordinary people – become the most powerful that we can be. We will send a clear message to our government that we will not support any acts of aggression towards innocent citizens of any country… we will not be deceived into waging wars for ‘Global Corporate’ greed and power. We are now organizing Pre-emptive Peace Strikes. YOU DO NOT NEED A UNION TO CALL A ‘STRIKE FOR PEACE’ THE PEOPLE CALL IT THEMSELVES! YOU DO NOT NEED TO BE A WORKER TO GO ON STRIKE FOR PEACE! Includes: students, pensioners, housewives, anyone and everyone on benefit and disability allowance. NO SHOPPING! – BUY NOTHING! NO LABOUR ! – Only emergency workers and essential workers carry on, the rest of us shut down. NO SCHOOL, COLLEGE, UNIVERSITY, NURSERY – To prevent death and injury to others, it is more important to register your concerns, rather than worry about a few days off. NO TRANSPORT! Buses, underground, trains, planes. NO TV! They sensationalise war. *Strike does not include emergency and essential workers whose work and travel we support. Police, Fire Service, Nurses, Doctors, Ambulance, Carers and Emergency Utility Workers. ABOVE ALL – TAKE COURAGE – DON’T BE FEARFUL – YOU ARE DOING THE RIGHT THING! September 16, 2011, filed under PEACE STRIKE EVICTION ON PARLIAMENT SQUARE, PRASRA 2011, Statements from Peace Strike; No Comments. 15th September 2011. After consideration in the House, the ‘Police and Social Responsibility Bill’ has been granted Royal Assent. Be alert to the possible threat, to on-going protest at Parliament Square. Parliament is now again in recess, and will resume again from Monday 10th October. July 7, 2011, filed under Statements from Peace Strike; No Comments. We need to make peace in Parliament Square. June 15, 2011, filed under Statements from Peace Strike; No Comments. We urgently NEED to make the Peace in Parliament Square,for the sake of the people on who’s behalf we are suppose to be campaigning for. There are deep rooted grievances at the Square that should be put aside if we are to have any real chance of working effectively for peace. Any personal allegations made against individuals in the Peacestrike Campaign can be dealt with and we are willing to do so. We can defend our actions if required. Peacestrike is working to promote peace for all people. We do not promote any acts of confrontation or abuse, aimed at anyone. We do not encourage any abuse of ANY individual, regardless who they are. We may have made mistakes. If we have faltered, then we have apologised. We are open to discussion and indeed we would like open dialogue with everyone at the Square. If there is a problem then we…. With the impending threat of the new ‘POLICE REFORM AND SOCIAL RESPONSIBILITY BILL’ going through Parliament right now, this would be a good time to unite for the common cause of defending Parliament Square for the RIGHT reasons. Surly we can do that? BOTTOM LINE…..IF WE ARE UNABLE, AS A PEACE MOVEMENT,TO SORT OUT OUR OWN HOUSE, HOW ARE WE SUPPOSE TO RECONCILE THE TRAGIC ISSUES OF ISRAEL, PALESTINE AND AFGHANISTAN ETC? We are not asking people to come down to the Square and take sides or get involved in all the “negative” issues. We send out this plea for people to come down to promote peace and spread some love, in order to lift the very heavy atmosphere that hangs over the place at present. There is also quite a large group of homeless people. They are disenfranchised and distressed at times. However, they are trying to survive, and are generally in good humour, despite obvious struggles and issues. We all need support and encouragement…..It is not our place to say whether they should be at the Square or not. The point is, until they are moved on, for whatever reason, they are entitled to be there. At present, it is their home. The peace movement is not Parliament Square, it is made up of all the campaigns, groups, and individuals who speak out against oppresion and injustice. We are all a part of the on-going struggle, and we are all linked in the work we collectively do. We are not separate, and we all need each others support. No one does it on their own! We may not be able to heal the individual relationship breakdowns that have taken hold in the Square, but we must not allow it to become a “NO GO ZONE! Come along and bring some peace, positive thoughts and views. Above all, don’t go away disenchanted! Without effort and goodwill there is no hope for change. WE HAVE AN INTERNATIONAL DUTY, AND RESPONSIBILITY, TO ALL VICTIMS OF WAR AND OPPRESSION, TO SET ASIDE OUR PERSONAL DIFFERENCES. This message goes out in good faith. May 12, 2011, filed under PEACE STRIKE EVICTION ON PARLIAMENT SQUARE, PRASRA 2011, Statements from Peace Strike; No Comments. Keep up with this Bill as it travels through Parliament. The Bill is now at Committee Stage in the House of Lords. This Bill could be passed into law by the beginning of the Summer recess. This is of more concern at the moment, than the High Court Injunction, which will not be heard until October. Please be alert to this very real impending threat. Also, as a point of interest, there are a further two Bills in the system. They have started in the House of Lords. January 18, 2011, filed under PEACE STRIKE EVICTION ON PARLIAMENT SQUARE, PRASRA 2011, Statements from Peace Strike; No Comments. On the afternoon of the 17th January, we received a letter from Westminster City Council stating that we are an unlawful obstruction on the pavement opposite the Houses of Parliament. Also to make certain they achieve their objective, they have applied to the High Court for an injunction. They wanted a written reply by 12pm Friday 21st. The letter was confusing as it stated that all articles will be removed by 5pm, if we did not comply. We have replied to the legal department of Westminster City Council and have made it clear we intend to defend our ongoing stand at Parliament Square. We are now subject to legal proceedings, to be heard in the High Courts of Justice, sometime in March…. Peacestrike has occupied this area for the past 2 years with tents and display structures. To date, we have received no official complaints regarding obstruction, hygiene issues, or complaints regarding abusive or disruptive behavior. We take pride in the management of our on-going 24hr demonstration and accept we have a social responsibility in keeping our area in good order. Peacestrike also has two large box / plinth structures. One has been there since November 2009. We standby their legality, in keeping with the police dimensions stipulated in SOCPA ACT 2005. Peacestrike has four SOCPA ACT 2005 authorisations at Parliament Square and one in Whitehall. The threat to these rights should be through new legislation. The repeal of SOCPA ACT 2005 is in proposed legislation contained in the ‘Police Reform and Social Responsibility Bill’. This is now reached committee stage in the House of Commons. They ask people to submit objections, recommendations and concerns, to the committee by Feb……. If passed by both Houses, it will not come into law until after the Royal wedding. This is due process and proper procedure, and allows time for people to organise a counter argument and open the discussion to all parties who may be affected by such legislation. We feel that the SOCPA ACT 2005 and the European Convention of Human Rights, Articles 10 and 11 surly cannot be overturned by Highway legislation. 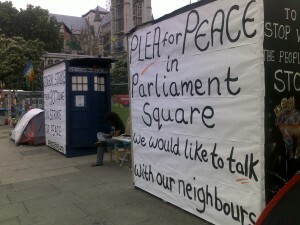 besides,very few people venture onto Parliament Square since it has been fenced off since July 2010. We feel it necessary, due to the change in circumstances, to make this statement on behalf of the good people of this country who are unaware of the serious threat to our great history of protest. If we do not act now, 24hr overnight protest will be outlawed. The reasons the demonstrations at Parliament Square have gone on for so long is directly connected to our on-going wars and illegal occupations of Afghanistan and Iraq. Remember, people, children, and soldiers are killed and seriously wounded every day! We have a heavy burden of responsibility to get this right, as time is short. As yet, there has been no real opportunity for public opposition or debate. All the media has centred on the concerns of the Home Office, politicians, council, GLA, and the police. Do we really want our Government to send a message out to the world that protest is stifled and now timetabled and controlled. In emergencies people will naturally not want to go home, such as the Tamils in 2009. Emotions cannot, and never will be controlled by legislation, especially if the Government of the day is responsible for the atrocities. The people of the country always have a duty to express their concerns. We should always have the right to be angry and outraged. The Public Order Act 1980 has always been available to the police, if things get out of hand. Other countries do not share this great privilege,therefore because we can we must be the voice for the voiceless. The Royal Family should be proud and protective of our heritage. We need to have a very frank and open discussion concerning this very important and historic right. There are many examples of on-going demonstrations of similar standing throughout the world. The Aboriginal Tent Embassy in Canberra, Australia, which has been there for over 39 years, since 1972 . It will continue, until the full rights of the Aboriginal People are restored. Faslane Peace Camp, Argyll and Bute, Scotland. Established in 1984…… some 28 years ago! Located by Faslane Nuclear Submarine Base. Vancouver, Canada on-going protest, 4 years plus. Recently won British Columbia Court of Appeal regarding Falun Gong on-going protest outside Chinese Consulate. Court over ruled Vancouver City Bylaws as unconstitutional, Oct 21st 2010. Chinese Embassy……over 8 years….Portland Place London, 24hr, on-going….Falun Gong Practitioners. Started 5th June 2002. Winnie the pig resided in a pen in Parliament Square, by the Churchill Statue, for 3 months between Feb – May 2000. There did not seem to be any objection at the time, indeed it would have been considered very British. Also, spent a day opposite Downing Street March 2008, and was visited by celebrities and MP’s and Lord Tebbit. Maybe she was tolerated, as the pig could not talk back! Democracy Village. Established in run up to election May1st, 2010 in Parliament Square, London. lasted 3 months. SOCPA ACT 2005 was never used. Royalty and Politicians have to live in the real world where protest is essential to the Democratic process. We do not live in a sanitised country or world,nor would we want to. As long as protest is reasonable and peaceful, we feel we have every right to keep going…. We therefore invite Royalty, Politicians,Police, Council Officials, GLA, Journalists, Lawyers and Campaigners to a meeting in the House of Commons. We are trying to get a committee room made available as soon as possible. We are confident we can come to an amicable agreement to suit all parties concerned. Without discussion there is no way forward. If dialogue fails ,or is just ignored, then Peacestrike intends to stand firm at Parliament Square, regardless of the consequences. Emails will be sent to parties concerned. Peacestrike acknowledges that the Parliament Square Peace Campaign is a separate campaign, and may not share the same views as expressed by Peacestrike.